I recently attended the eLearning in Africa conference in Windhoek, Namibia to meet with others active in my field and hear about some of the new developments taking place. The event was host to some very interesting people and presentations. I particularly enjoyed the closing debate with Dr Adele Botha’s illustrations of African innovations which have ensured sustainability — such as repairing and using old cell phones (the very early Nokia versions, known as “bricks”) and housing a community computer in a drum for protection from the weather. There were a number of themes that caught my eye, particularly given the recent ‘Moocs and educational development’ series of blogs by Ravi Murugesan. In his previous post (part 4), Ravi mentioned “separate” learners who prefer to rely on authoritative sources of information and “connected” learners who like to learn from discussions with others. Presenters at the conference generally concluded that learning is stronger when done in groups. 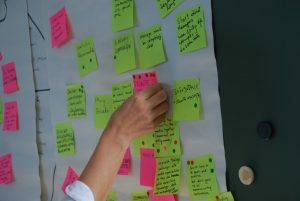 While a variety of teaching and learning methods should still be offered, group learning is increasingly favoured by students — whether sharing a hole in the wall computer in Mumbai, a community centre library in Cameroon or connecting by mobile phones with fellow trainee teachers in Namibia. Therefore, online fora are necessary when implementing any type of e-learning, but, as Ravi’s posts suggest, the quality of these may vary and will be influenced by the number of people contributing and the quality of their posts. The use of mobile devices for learning was another key theme. In her presentation on the potential for mobile learning in Central Northern Namibia, Aletta N.N. Ngaikukuete described how mobile phones can be used to aid but not replace traditional ways of learning. In a comparative study between a school in Central Northern Namibia and a similar state funded, rural school in UK, she noted that in both countries there is large usage of mobile phones, with resulting familiarity with the devices and their functions. They allow for anytime, anywhere learning. In Namibia, the number of mobile phone subscribers is greater than the population! However, the type of phone differs between the two countries, and students in Namibia seldom have smart phones, so do not have access to the internet. They also tend to have phones with very small screens and costs of use (both receiving data and recharging) can affect availability. So, my main concern here would be lack of equity with some students able to access more information and read it more easily than others. An interesting question was asked about the lack of adherence to normal rules for grammar and spelling commonly found in texting – one response argued that texting actually helps students to better understand phonetics. Publishers were asked to consider that “bricks” may be used to read their materials, which makes E-Pub format a more attractive option when compared to PDF. So what does this mean for us in the research communication sector? 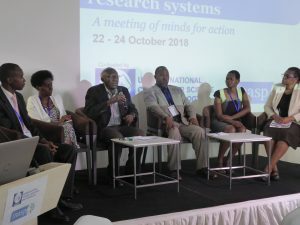 Going by the African examples shared at this conference, the next generation of researchers will be entering the university system familiar with e-learning software and techniques, so their lecturers and librarians need to be prepared for this. Mobile devices will be widely used by these early career researchers, so materials should be adaptable for these devices. Institutions may need to look at developing constructive policies around the use of mobiles and will find the UNESCO Policy Guidelines for Mobile Learning a good starting point. 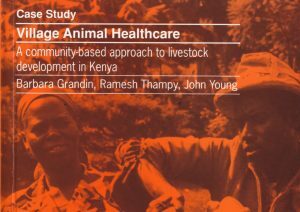 Thanks Anne for this engaging report on eLearning Africa. I was at this conference 2 years back in Tanzania and I think m-learning was one of the major themes then too. Personally I don’t think “brick” phones lend themselves to sustained study and learning. Even with a BlackBerry I’m not inclined to read long documents, do extensive searching, type more than a few lines, or watch instructional videos. 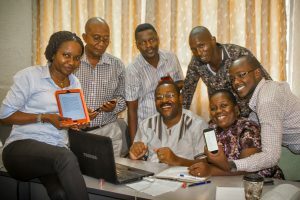 I’ve heard a lot about how mobile phones have empowered people in an ICTD context – especially agriculture – but I’d like to see more evidence of basic mobile phones making a difference in education.